This is an amazing opportunity to have some absolutely wonderful art in your home, which used to belong to one of the all-time great SF authors. 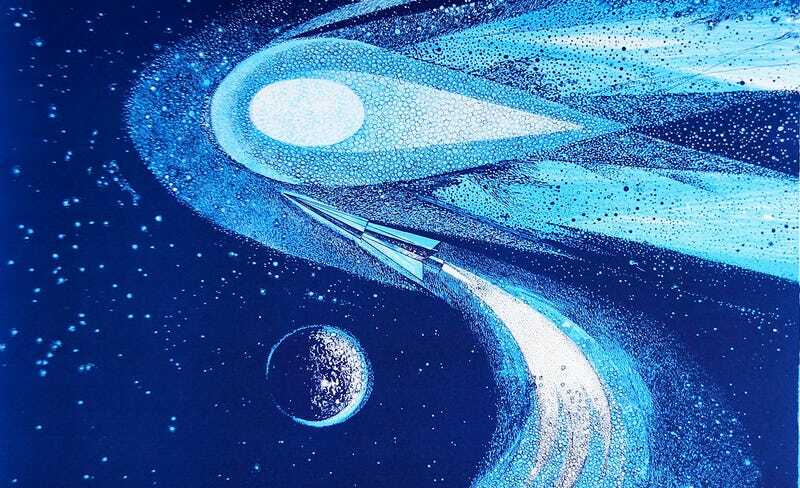 As we mentioned last night, Ray Bradbury's art collection is being auctioned off. And here's just some of the incredible artwork you could own. Top image: one of 10 lithographs in "Ten Views of the Moon," a collaboration between Bradbury and artist Joseph Mugnaini. Dean Ellis cover painting for The Illustrated Man. Robert Watson cover painting for The Martian Chronicles. Mixed media piece showing Bradbury surrounded by iconography from his works. Lithographs of dragon and creature engaged in battle, from 7th Voyage of Sinbad. Personally owned art. Artist unknown. James Bingham art for Bradbury's story "The Fog Horn"
One of 10 lithographs in "Ten Views of the Moon," a collaboration between Bradbury and artist Joseph Mugnaini. Preliminary cover art for Fahrehnheit 451 by Joseph Mugnaini. Cover art for Fahrehnheit 451 by Joseph Mugnaini. Preliminary cover art for Fahrehnheit 451 by Golden Apples of the Sun.